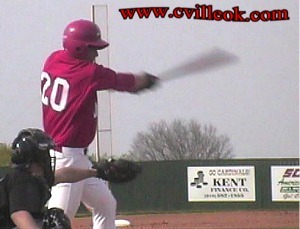 Tyler Whitaker doubles above to plate the first of Collinsville's 6 runs in the 2nd inning. 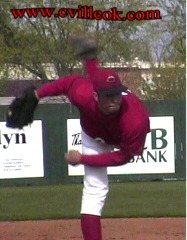 Jason Scott scored that first run Monday April 12th here against Wagoner. 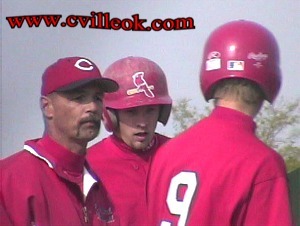 Coach Tony Reeder (left) tells batter Ricky Rimpley (#9) the plan to bring Chad Ausmus (center) in from third base in the second inning. 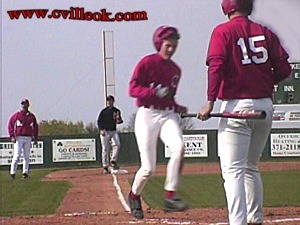 A good sign -- Cory Flynn (left) has his arms loaded with gloves of all the players on base and batting. 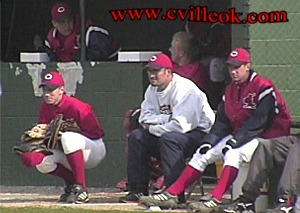 Assistant Coach Damon Herald and the other players look on from the Card's dugout. 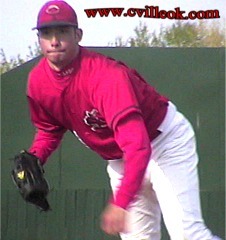 Collinsville Cardinal pitcher Shane Statum threw a complete game (5 inning runrule) no-hitter, allowing only one runner to reach first on a 3-2 walk.